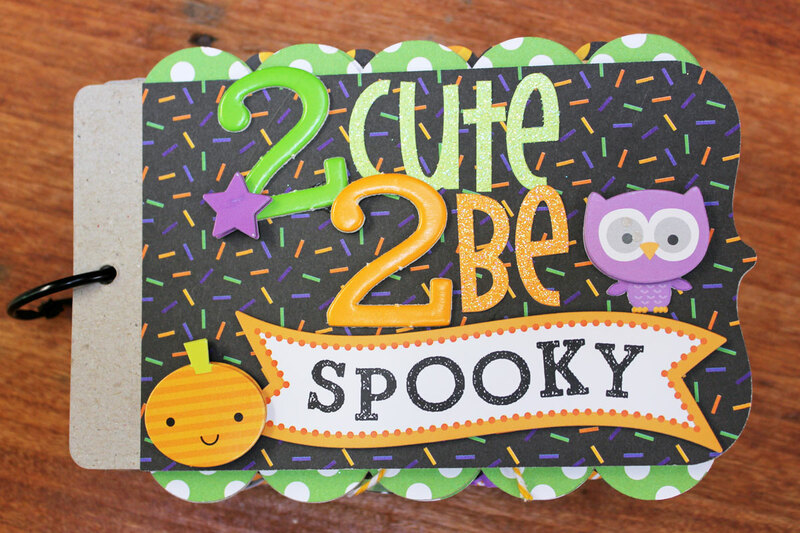 Hi Everyone, it's Kathy today with a fun mini I created using the new Ghouls & Goodies Collection. I LOVE Halloween... I love seeing all of the neighborhood kiddos in their costumes, and of course, there is the candy... Unfortunately my daughter has reached the age where she doesn't Trick or Treat anymore!!! (sniff...) soooo... I dug out 15 years of pictures to create a mini that shows her in her costumes throughout those years! I really wanted to use Doodlebug's new Chippers...and since my album is pretty mini... I decided to substitute the number "2" for the word "too" so it would all fit! If you haven't seen the Chippers yet...they are FABULOUS! From there, I featured each costume year on it's own page...I used lots of Teensy Type Alphas to document the years. I LOVE the Halloween Treats Sprinkles Shapes!! And the new Mini Paperclips are fun to use! I decided to add Sprinkles Vellum in between some of my pages. Mostly I left them plain, but I couldn't resist adding the Spider from the Diecuts Craft Kit to the one below...even better is that he is double sided so it looks like he's peeking through the next page! Only Doodlebug could make a spider cute! Also, if you didn't know, the new Halloween Sprinkles are sparkly!!! I think I used just about all of the Doodlepops from this collection...they were too cute to resist! The new Washi tapes are great too...I wanted them to show a bit more on my pages, so I first put them on white cardstock and cut them out so they stand out. I think I used just about everything in the making of this mini!! There was no sticker sheet or embellishment left untouched! The great thing about this collection is that it works for all sorts of costumes...cute, scary, bright colors or black...it all coordinates well! Well, that's it for me today...make sure to keep stopping by the blog to get more Ghouls & Goodies inspiration! You'll be so happy you did! Pinned the whole book, because there's such adorable ideas in this! Love this Kathy! Great job, and good job finding all those pics from Halloweens past! OMG this collections is perfect for mini albums. I love the vellum page dividers! Great way to document all of their costumes! I pinned! Totally adorable, Kathy! Love how you used the vellum in here. What a fabulous idea to make a mini to see costumes from over the years! Awesome. This is so cute. Love this collection. This is such a cute mini album!!! Precious!! I know this iff offf topic but I'm looking into starting my own blog and was curious what alll is needed to gett setup? What an adorable mini album! I love the variety of patterned papers and embellishments. I pinned this adorable mini album. This is Amazing - Kathy did awesome and I want to win this collection so I can make one of these ASAP - mini albums are just the best and this one tickles my fancy completely!! FUN & FABULOUS mini Kathy!!! WOW - how COOL that your pages have 15 years of BOO-tiful costumes!! !